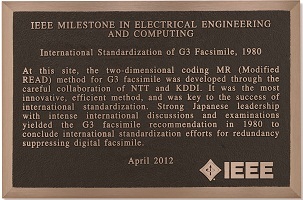 Dedication Ceremony of IEEE Milestone for the International Standardization of G3 Facsimile was held on April 5, 2012, at Imperial Hotel, Tokyo, Japan. The two-dimensional coding MR (Modified READ) method for G3 facsimile was developed through the careful collaboration of NTT and KDDI. This method concluded international standardization in 1980. It was approved as an IEEE Milestone on July 6, 2011. IEEE Tokyo Section hosted the Dedication Ceremony for the Plaque of IEEE Milestone in Electrical Engineering and Computing and invited many guests including Prof. Gordon Day, IEEE President, Prof. Tomonori Aoyama, Chair, IEEE Tokyo Section, other executive committee members, and executives of national academic institutes and societies. In this ceremony, Prof. Tomonori Aoyama gave an address, and Dr. Eiichi Ohno, IEEE Japan Council History Committee Chair, explained the background of the approval. Prof. Gordon Day presented commemorative plaques to Mr. Satoshi Miura, President and CEO, NIPPON TELEGRAPH AND TELEPHONE CORPORATION, and Mr. Takashi Tanaka, President, KDDI CORPORATION. After the Dedication Ceremony and the party, the 2012 Fourth Lecture of IEEE Tokyo Section entitled "Commemoration of IEEE Milestone Award on International Standardization of G3 Facsimile in 1980" was held in Sakura on the 4th floor, Imperial Hotel with 124 participants. To start, Dr. Eiichi Ohno, IEEE Japan Council History Committee Chair, gave an introductory talk on IEEE Milestones. The next two lectures shared a common theme "Globally Expanding G3FAX" and were presented by Dr. Toyomichi Yamada, Senior Research Engineer of Electrical Communication Laboratories of NTT, ret. and Professor Emeritus of Musashi Institute of Technology and Dr. Yasuhiro Yamazaki, Senior Research Engineer of KDDI R&D Laboratories, ret. and Professor of Tokai University, ret. Their lectures were entitled "Redundancy Reduction Coding Techniques of G3FAX for International Standardization" and "Role and Effectiveness of International Standardization in G3FAX" respectively. They presented technical overview of G3FAX and their dedications toward its successful standardization. 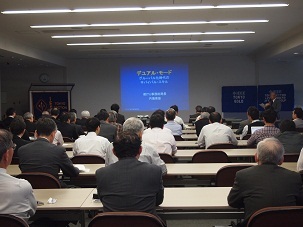 The 2012 Fifth Lecture of IEEE Tokyo Section was held in Japan Society for the Promotion of Machine Industry Hall in the 2nd basement floor with 87 participants. Opening address was given by Prof. Tomonori Aoyama, IEEE Tokyo Section Chair. Then Dr. Gordon Day, IEEE President gave a lecture entitled "Thoughts for Young Engineers". Then four engineers (Dr. Yasuharu Ohgoe, Tokyo GOLD Affinity Group Chair, Dr. Mamiko Inamori, JC WIE Affinity Group Vice Secretary, Mr. Keiichi Zenpo, Tokyo Young Researchers Workshop Chair, Mr. Ko Kikuta, Keio University Student Branch Past Chair) presented their activities. This stimulating occasion encouraged audiences with quite active Q. and A. 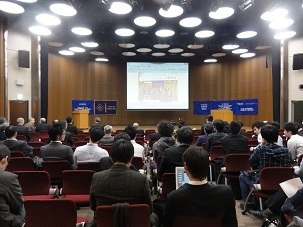 The 2012 Sixth Lecture of IEEE Tokyo Section was co-held with Life Members Affinity Group (LMAG) and Tokyo GOLD Affinity Group, in cooperation with The Institute of Electronics, Information and Communication Engineers at Chuo University Korakuen Campus with 87 participants on Monday, April 9th, at 4:00 p.m. The lecturer was Mr. Yoshio Utsumi (former Secretary-General of International Telecommunication Union (ITU), recipient of 2012 IEEE Honorary Membership). After the introduction by Dr. Habara, LMAG Chair, Mr. Utsumi gave a lecture entitled "Dual mode - Survival skill in globalization era", within which he talked his job at ITU, an "inscrutable" characteristic of Japan(ese) and the beacon we should look to. The lecture was succeeded with quite active Q&A from the audience including students. 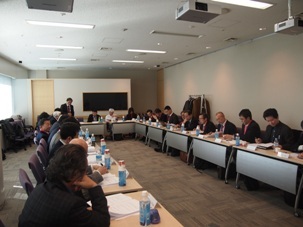 The 2012 First Meeting of Japan Council Executive Committee was held on Thursday, March 29, 2012, from 3:00 p.m. at Shiodome City Center, Tokyo.